When picking the best storage container for your prized possessions, there are tons of options to choose from. Finding the right storage container can be a tough decision so we decided to help you with a quick review that covers a variety of storage containers and the benefits of each. Probably the most common container is a recycled box. This could be an ald Amazon shipping box, something used to store food, or possibly a box from a recent appliance purchase. Recycled boxes can be an easy to find and cost effective way to store your possessions however they do come with some drawbacks. The main concern with a recycled box is its ability to stand up to wear and tear. Boxes can become damaged easily and aren’t very weather proof. Another drawback to these types of boxes is that it can be hard to find matching sets. This makes it harder to stack and fit boxes in an orderly fashion. 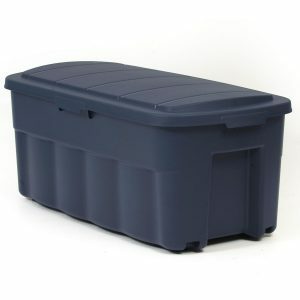 Plastic containers are a great choice if you’re looking for boxes that can withstand the elements. Plastic boxes also often come in stacking configurations, making it super easy to stack several similar containers together without worrying about them toppling over. Plastic containers are by far the best type of container when it comes time to store your possessions. So what’s not to love? Pricing can be an issue. Although plastic containers can be found for less than $5 to $10, if you’re in need of several containers at once they can become a significant investment. Be sure to plan ahead and look for deals before you stock up on containers. Crates are by far the best type of storage container if you’re serious about storage. Crates are rugged and build for transportation. Crates often have heavy duty handles, sturdy locking systems, and large storage volumes. While crates may be the best solution out there, they can be expensive. If you can stomach the expense, you might not be able to handle the weight. Often times crates need to be lifted by two people and in some cases machinery like a fork lift. Be sure to only buy crates that you can manage with the resources you have available. Once you’ve found your perfect storage container and have your stuff packed up, be sure to store it at the best facility possible. Find a Bargain Storage facility near you today! 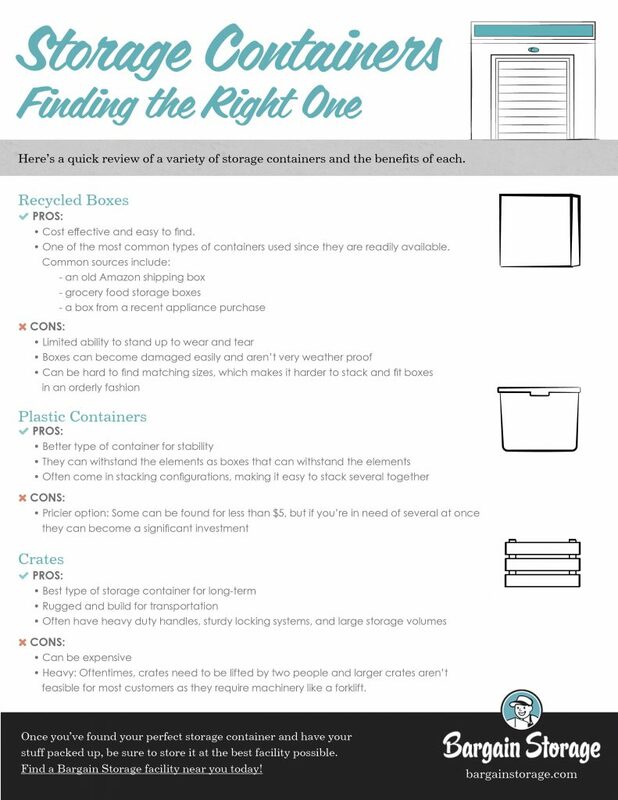 Download our helpful checklist to find the best container option for your self-storage unit. Self-Storage & Humidity: What Should You Know?